ETHEL BASTON ELEMENTARY SCHOOL 3200 Highway 100 So. Ethel Baston Elementary School was built in 1954-55 for $700,000. The Village condemned land owned by a Mr. Furber (paid $7,000) and Iverson Inc. (paid $10,000). Architects were Bissell and Belair of Minneapolis. The initial building had 20 rooms. 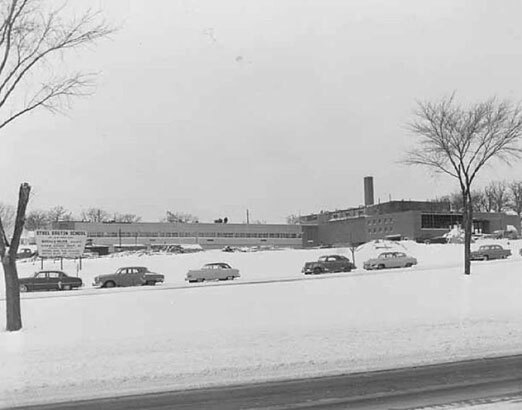 1954 photo courtesy Minnesota Historical Society. The road in the foreground is Highway 100. The cars are parked along the on-ramp from Minnetonka Blvd. The school was named for longtime Park teacher Ethel Maud Baston, who taught for 43 years. She also served as supervisor of elementary education for the entire Village. Miss Baston died on July 28, 1954. Ethel Baston School was dedicated on October 9, 1955. 600 people attended. The High School Glee Club sang “Beautiful Savior” and “Send Out Thy Spirit.” Click Here for a recently discovered silent piece of film from the dedication. (Also on the reel is some footage of a trial; perhaps this film came from a news station.) Many thanks to the Pavek Museum of Broadcasting for dubbing the film. The school’s first principal was Raymond R. Newberg, who went on to marry Cedar Manor principal Helen Hansen in 1961. Census: 672 students and 21 teachers. Leo C. Siegel became principal. Census: 730 students, 22 teachers. Mr. Siegel recalls that several teachers took their students to Lilac Park, the roadside park across Highway 100, for picnics and special events. Census: 582 students, 21 teachers. A stuffed lamb was the prize for the classroom with the highest percentage of PTA membership. To appeal to the boys, they added a space ship. Census: 608 students, 21 teachers. Census: 568 students, 21 teachers. Census: 625 students, 22 teachers. Leo Siegel became principal at Cedar Manor. Mr. Ardelle Athman was principal. In 1975 it was proposed that the school be converted to an alternative school, but only four of the needed 12 teachers volunteered so the idea was dropped. In 1982 the school was closed and sold to Groves Learning Center.